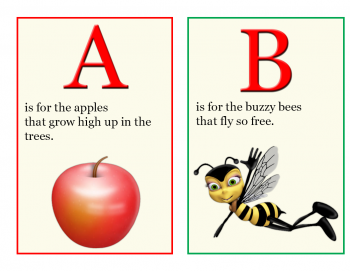 Help toddlers, preschoolers and kindergartners get a jump on reading by teaching them the alphabet at home. Just print out this handy book filled with letters, phonically-related images and rhymes that will make the learning more fun. To print out this book, just click on the image below. If you need help downloading the printable, check out these helpful tips. Your book will be a little more durable if you print it on cardstock, but you can use regular copy paper if you wish. Once you've printed all the pages, just staple them together along one edge and the book is ready to use. If you want something a little fancier, you can make a book by inserting these pages into a photo album. Learning the alphabet is the first step on the road to actual reading, and this book is designed with that goal in mind. A child that reads well naturally has a better chance of succeeding in school. Eventually, the day will come when all your effort pays off, and your child is finally able to read this book to you. Reading is an invaluable skill that no one should be without, so lay a solid foundation for your child's education by working on the alphabet together at home. 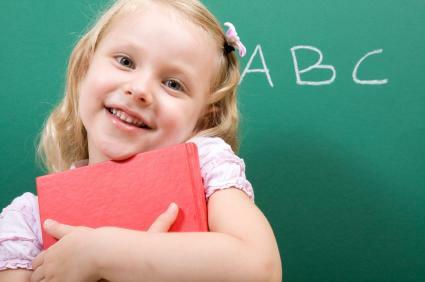 The feeling of confidence your child will gain from this accomplishment just might spark a lifelong love of learning.